Kick start your day with this energy boosting treat. Rich in flavour and nutrients. 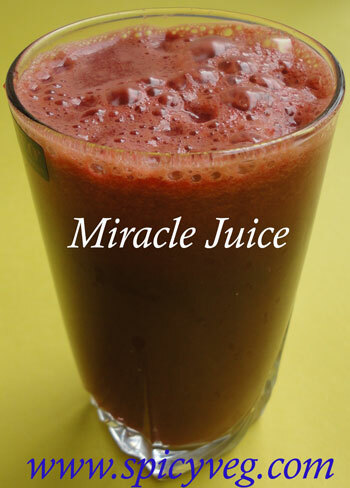 Miracle juice is high in carbohydrates as it contains beetroot and carrots, which is the richest source of natural sugars. This juice is a healthy accompaniment to any breakfast or snack.This is highly nutritious and it easily absorbs! Very effective if you need to loose weight. You will notice your immune system will be improved after 2 week routine. 1.Blend all the ingredients using little water (if required) till smooth. 2.Strain the juice using a strainer or a muslin cloth. 3.add lemon juice (optional ) for a refreshing taste. 4.Add some crushed ice in 2 glasses and pour the juice over it. 1. Is great for those wanting to assist their bodies against cancer and other diseases. 2. Strengthens the lungs, heart and may help regulate high blood pressure. 3. May strengthen the immune system. 4. Good for the eyesight, eliminate red and tired eyes or dry eyes. 5. Helps to eliminate pain from physical training and muscle aches. 6. May improves bad breath due to indigestion, throat infection. When to drink it: Drink it first thing in the morning with the empty stomach! After one hour you can eat breakfast.